If you’re a walker or a runner, you know you need at least two pair of good shoes so you can let your shoes rest for at least a day between walks/runs. 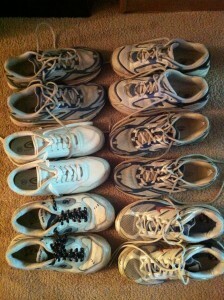 Unpacking over the past few weeks, I have discovered just how many “extra” pairs I have. I have “nice” shoes, too – more than I need, I’m sure (although a girl can never have too many pairs of boots). But I think I have enough walking shoes to keep me in rotation for a little while. Ya think?